Although the center of Tropical Depression 9 moved away from Cuba and into the southeastern Gulf of Mexico, western Cuba was still getting drenched from the system. 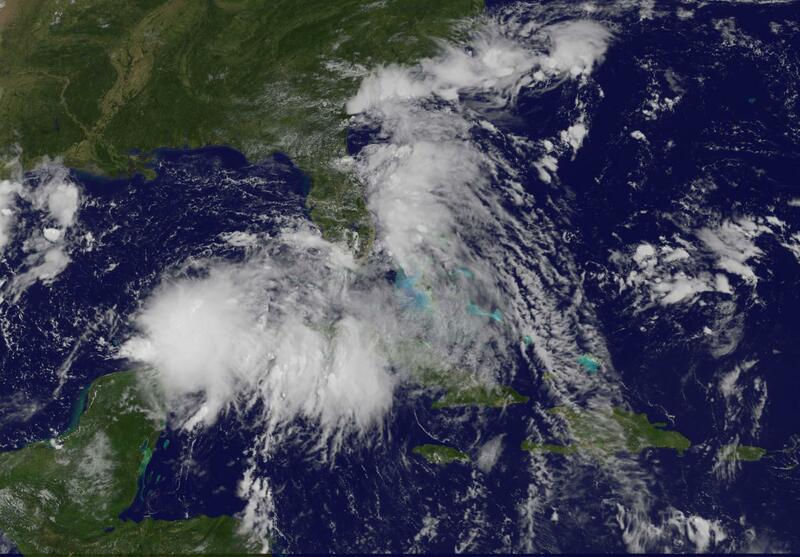 A visible image from NOAA's GOES-East satellite showed the reach of the large depression. The National Hurricane Center said at 11 a.m. EDT that torrential rains continue over western Cuba and that a tropical storm watch likely to be issued for a portion of the Florida Gulf Coast later today, Aug. 30. An infrared look at Tropical Depression 9 on Aug. 30 at 3:05 a.m. EDT (0705 UTC) from the Atmospheric Infrared Sounder or AIRS instrument aboard NASA's Aqua satellite showed that the strongest storms were more concentrated around the center of circulation than the visible cloud imagery showed. Infrared data takes temperatures, and the colder the cloud tops, the higher they are in the troposphere. Cloud tops around the center of Tropical Depression 9 were as cold as or colder than minus 63 degrees Fahrenheit (minus 53 degrees Celsius), indicating they were high in the troposphere. Storms with cloud tops that cold have been shown to generate heavy rainfall. Visible satellite imagery on Aug. 30 at 10:45 a.m. EDT from NOAA GOES-East showed the extent of the large depression. 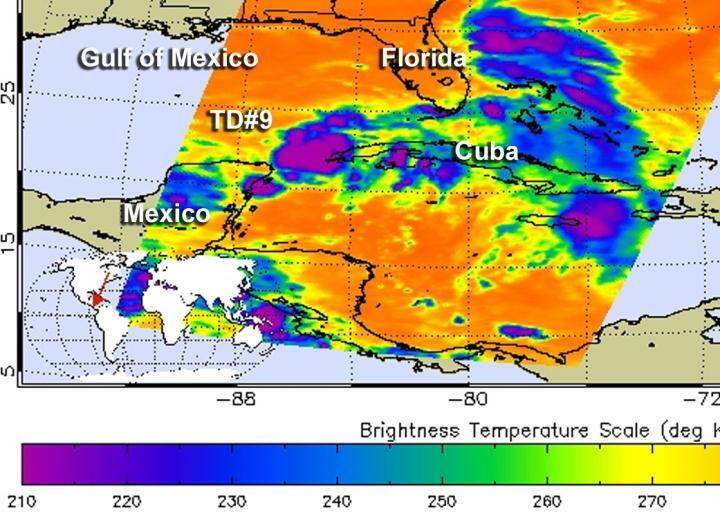 The southwestern extent of the depression's clouds were over the northeastern part of Mexico's Yucatan Peninsula, while the northeastern extent of the depression's clouds stretched over Cuba and the Florida Keys. The GOES image was generated at the NASA/NOAA GOES Project at NASA's Goddard Space Flight Center, Greenbelt, Maryland. The National Hurricane Center (NHC) reported at 11 a.m. EDT (1500 UTC), the center of Tropical Depression Nine was located near 24.0 degrees north latitude and 87.2 degrees west longitude. That's about 340 miles (550 km) west of Key West, Florida, and 310 miles (495 km) west of Havana, Cuba. The depression is moving toward the west-northwest near 7 mph (11 kph). NHC forecasts a turn toward the northwest is expected later today, Aug. 30, followed by a turn toward the north-northwest tonight. A turn toward the north-northeast is expected on Wednesday. On the forecast track, the center of the depression will continue to move slowly away from western Cuba, and move over the eastern Gulf of Mexico during the next 48 hours. Maximum sustained winds are near 35 mph (55 kph) with higher gusts. Some strengthening is forecast during the next 48 hours, and the depression is expected to become a tropical storm today. For updated forecasts, visit the NHC website at http://www.nhc.noaa.gov.